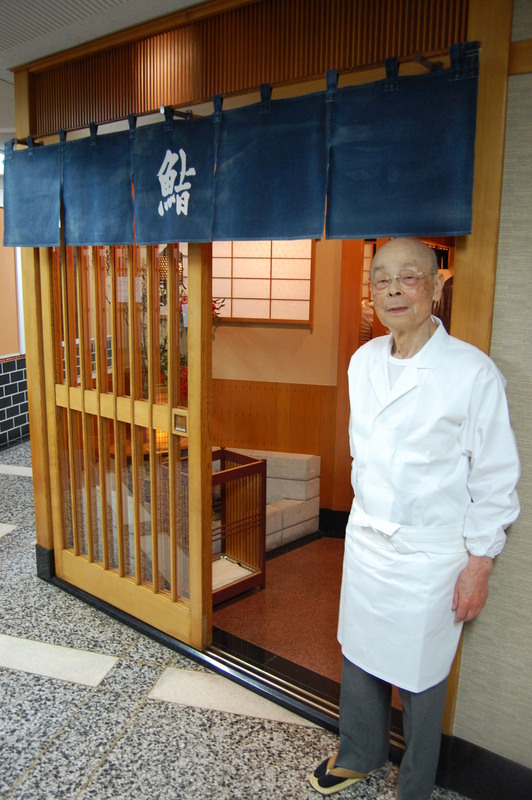 My journey to Sukiyabashi Jirō started almost a year ago. Last February I was contacted by the Chowzter website to be the Tokyo Chowzter. I was happy to join this amazing team of chowzters and helped to suggest my favorite spots in Tokyo here. Chowzter will help you in many parts of the world. Over the course of the year I have met people behind the scenes at Chowzter as well as London Chowzter, Niamh Shields, cookbook author and brilliance behind Eat Like a Girl. Chowzter founder, Jeffrey Merrihue, as been very hands on from the beginning. 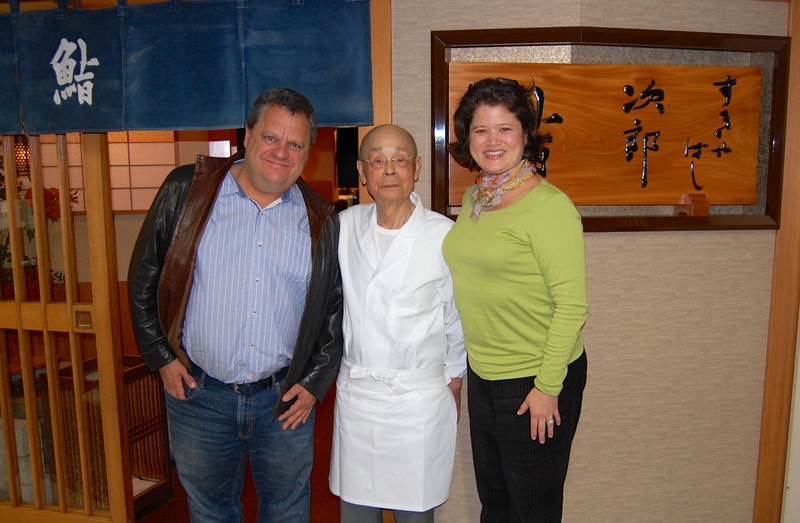 I remember a while back Jeffrey e-mailing me and asking if I had been to Sukiyabashi Jirō. I said no, and that I would love to go someday, especially if Jeffrey sponsor my meal. He said that when he was in Tokyo we would go. While I did not hold my breath, I never forgot, and kept waiting for news of his arrival. Well, the great news came. Jeffrey was coming to Tokyo. He was going to be here for a week to film chef Yoshihiro Narisawa for a documentary. 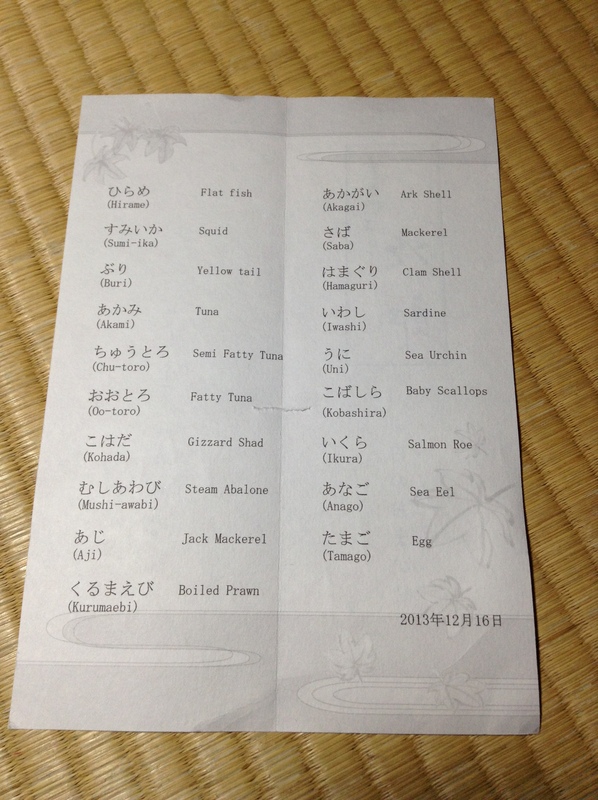 He managed to get a 7:00 p.m. reservation for two at Sukiyabashi Jirō in the busy month of December. We arrived a bit before 7:00 p.m. and I pointed out to Jeffrey the two other restaurants that share the hallway with Sukiyabashi Jirō. Birdland, one of my favorite yakitori restaurants in Tokyo (it’s in my book, Food Sake Tokyo) and Nodaiwa, a branch of the 5th-generation unagi restaurant. And, these three restaurants share the same bathroom in the hallway. The bathroom is far below Michelin three-star standards. But, who cares? In the taxi on our way to the restaurant we discussed the upcoming dinner. “Don’t take photos,” I suggested. Do expect a fast meal. “40 minutes?” asked Jeffrey. We walked in promptly at 7:00 p.m. and were seated at the counter, right in front of the master. This thrilled me as I have heard of some people dining there and having their sushi made by the son and not Jirō. It’s a simple restaurant. Only ten seats at the counter and a few tables to the side. It’s not in the Ginza subway as is often misreported. It is in the basement of a building. The access to the basement happens to be a stairwell that leads to the massive subway station that is underground the Ginza shopping district. Seated next to us were two Japanese businessmen and at the end of the counter, an Asian couple. We were asked if there was anything we couldn’t eat and I said that I was allergic to shrimp. The son told me that I would not be getting the kuruma-ebi or the tamago as it is made with shrimp. I nodded in agreement. The son told Jirō that I would not be having these two courses and Jirō nodded. We ordered a beer, enjoyed a well-deserved kampai toast, and washed our hands with the warm wet towels. There was a small wet paper napkin at each seating to wipe your fingers with between pieces. There were three behind the counter. Jirō, his son, and a young apprentice. The young boy helped keep things running smoothly by wiping down our trays every now and then and fetching our beers. The son cut all of the seafood and would lay the cut pieces on Jirō’s cutting board. Jirō would then form the vinegared rice to the texture of a soft pillow, added the cut seafood, and serve it to each of us. The only pieces the son made were the gunkan, or pieces with nori, like the uni. 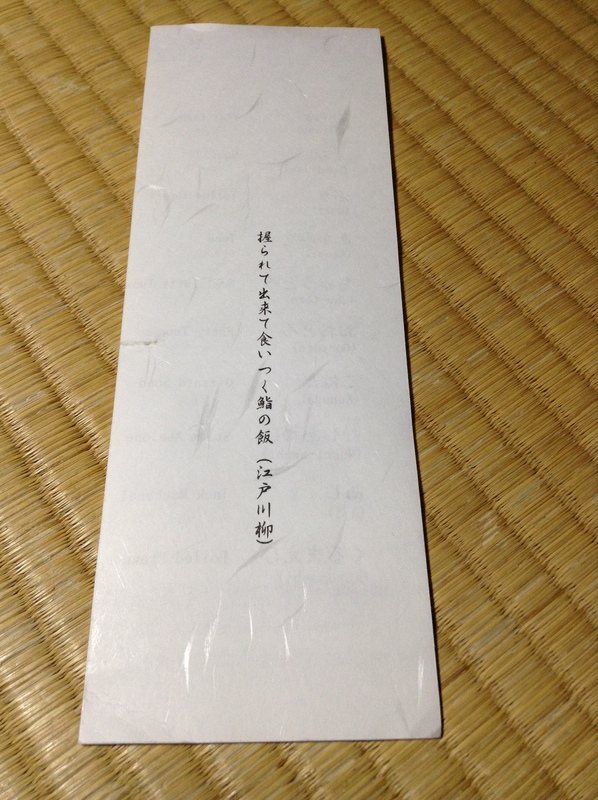 At the beginning of the meal there was a nice rhythm going with Jirō serving each of the six customers in order. But, at some point, the Asian couple slowed down the pace at which they were eating and the rhythm was awry. The rest of the four of us finished our meal together. I didn’t notice, but Jeffrey said that at one point Jirō had put more than one piece of sushi in front of the Asian guy. A minor slap of the wrist? At the end of the meal we were asked if there was anything else we would like to have. I was hoping to try kinmedai (splendid alfonsino) or tako (octopus). I asked if we could order anything that wasn’t on today’s menu and was told no. So we said that we were finished. Jeffrey looked down at his watch and said, “twenty-nine minutes”. We were escorted to a table where the perfect dessert was waiting for us. A slice of ripe melon. You know the ones that can sell for hundreds of dollars a piece at department stores or fruit specialty stores. The best way to end the meal. 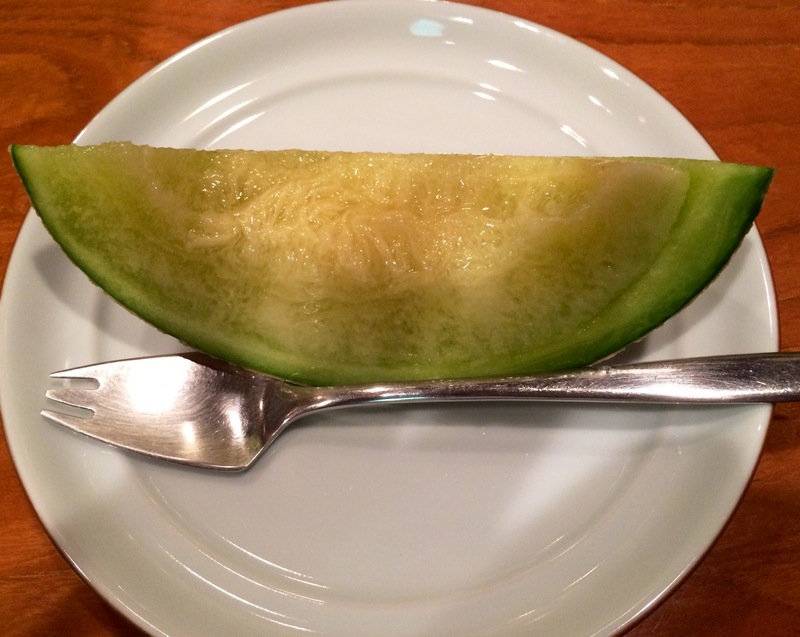 Japanese muskmelons, like this one, are the perfect finish to any meal. Juicy, sweet, and unforgettable. I love as this is the only photo of food that was taken this night. I know Jeffrey wanted very much to take a photo of one of the pieces of sushi. Menu for Monday, December 16, 2013. I really enjoyed our meal. And, I am still thinking about some of the pieces I had, three weeks later. Some of the highlights for me were the kanburi (winter yellowtail) that melted in my mouth. The hikarimono (silvery fish) like kohada (gizzard shad) and saba (Pacific mackerel) were seasoned just right, a bit salty and a nice tartness from the vinegar. The clams were especially delightful. The akagai (ark shell) is a red clam that had a nice crunchiness to it and the hamaguri was cooked just right and dressed with a sweet tare (soy reduction). The anago (sea eel) was so tender I have no idea how it was cut and picked up. I was not served the two shrimp courses and thought I would get something in lieu, but did not. Oh well. C’est la vie. When the first shrimp course came around and there were only three pieces of shrimp on Jirō’s cutting board he asked where the fourth piece was. His son, kindly reminded him that I was not going to have any of the shrimp courses. Jirō then said he forgot, and the son had a small laugh, reminding his father that he is becoming forgetful. I shared this with Jeffrey and we all enjoyed the moment. After we finished our melon we paid our compliments, “gochisō sama deshita”. The son went behind the register to collect payment and Jirō waited for us outside. He was gracious to let us shower him with compliments and posed for the photo that so many fans must ask him for. I’ve spoken with many people who’ve eaten here. Some are disappointed that the meal is so fast. So, if you want to dine here, expect a quick meal. If you want to linger over your sushi, there are several other restaurants of this caliber who will let you take your time. I have also heard that he’s not nice to you unless you come in with a regular customer. I would have to disagree with that as the staff, including Jirō, were very kind to us. 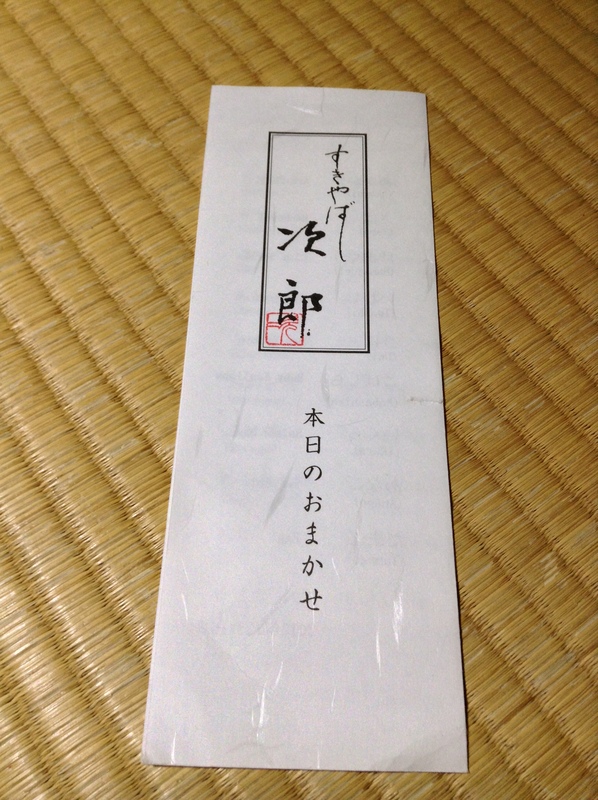 Jirō is a shokunin, a skilled craftsman, and his art is sushi. My take-away from the night was that his time left at the restaurant is limited and I am glad that we could experience a meal with the master sushi chef. I will remember this evening for a long time. I am sure that I will be talking about the meal long after I forget it. But it is the experience that I will never forget. If wanting to make a reservation, check the website as they will say if they are fully booked for that month and when they start taking reservations for the next month. As my friend Jeffrey says, “it was a religious experience”. I am surprised that you were not given alternatives to the shrimp pieces you had to miss. Even if those were repeats of others already in the day’s menu. And I must admit that a half hour experience, it’s just very very hard to justify for most of us. Yet clearly it was superlative, given how you were still thinking on it so long afterwards. I think I would probably choose one of the places where it’s a little slower-paced and also, given my lack of sufficient Japanese language, somewhere known to be able to cater for English-speaking gaijin! amazing! Thanks for sharing this wonderful experience. Arigato Shirley-san! Hope you are well in Singapore. Congratulations Yukari and thanks for sharing – and so glad you were able to meet Jiro! Me too. He could have retired some twenty years ago but is still behind the counter. His son should be nearing the age to retire, but is still in the shadows of his father.